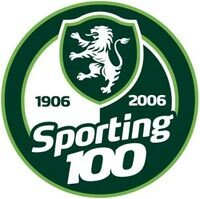 Since the clubs founding on the 1st of July 1906, Sporting has had six badges, all of which have included the colour green and a lion. 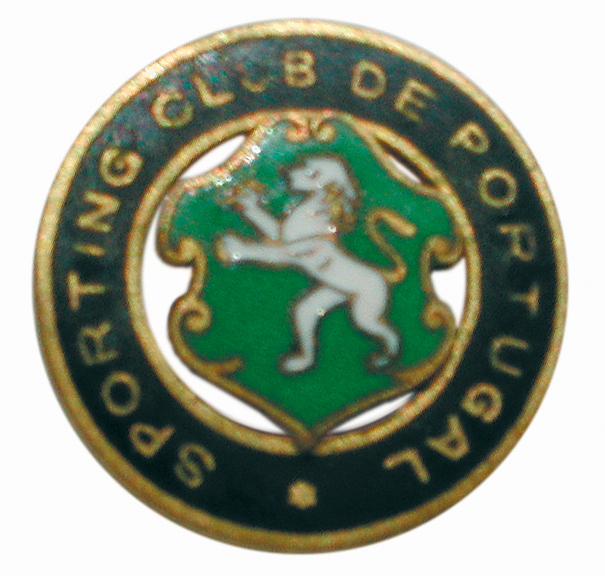 Sporting's first badge has its origins in the summer of 1905, in the conversations held in Cascais between José Holtreman Roquette (José Alvalade), The José Roquette Brothers, António Rebelo de Andrade and D. Fernando de Castelo Branco (Pombeiro). José Alvalade asked D. Fernando Castelo Branco (Pombeiro) for authorisation to use the rampant lion from his coat of arms as the symbol of the Club. Pombeiro authorised the use, but asked that the blue found in the background of his coat of arms not be used. The quartet instead chose the colour green, the colour that represented the expression of the hope of success for the new club. 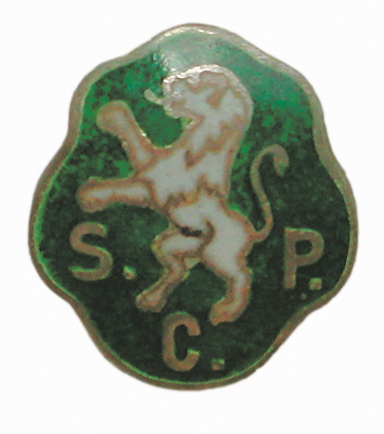 In 1907, Casa Anjos (House of Angels), of Lisbon, presented the badge: A circular emblem with a rampant lion, semi-encircled by the initials of the club (SCP), in silver font, with a green background. In 1910 Hugo Morais Sarmento returned from Germany to join Sporting as a goalkeeper, on the proposal of Manuel Monterrozo Carneiro. When he arrived at Sporting, he was dressed in a blue jacket, with a lapel emblazoned with four Germanic emblems. It was then that the idea to order the making of emblems in Germany was born. It was Morais Sarmento that designed the initial model and who took charge of the order. The new emblems arrived at Sporting on the 1st of April 1913: one with a rampant white lion on a shield with a green background, surrounded by a circular black skirting mounted by the name of the Club, written in white. Due to the immense success of the samples from Germany sent in 1923, the board decided to create new badges. However, the General Assembly that took place in January nominated a special committee that rejected the four models that were presented, one of them a creation by Júlio de Araújo (President of the Club from 1922 to 1923). 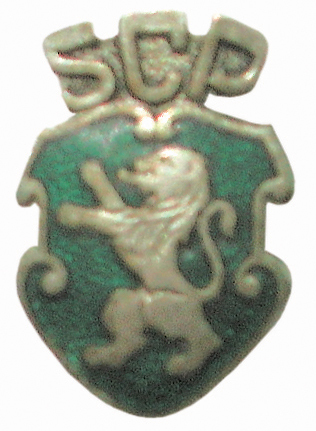 As such, ony in 1930 was the third badge accepted, which was the forefather of the badge that lasted until the end of the 20th century: a rampant lion, white, with the initials under the animal, with a green background. In 1945 a new emblem was born; an emblem which would highlight the monogram of the Club as the crowning symbol of the Clubs' emblem for the first time. The shield maintained its green background, with a rampant lion and monogram, both in the colour white. The symbol adopted an indented form atop the shield. 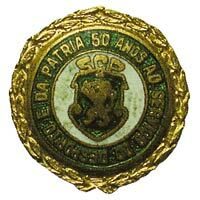 In 1956, in commemorating its first half-century of the Club's life, the administration created a symbol comprised of a golden laurel, bordered with green enamel, set with, in golden writing, the words "50 anos ao serviço do desporto e da Pátria" (50 years in the service of Sport and of the Nation). 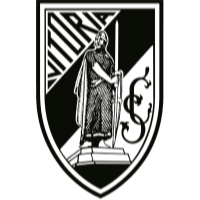 The inner circle of the emblem, made of white enamel, housed the official emblem of the Club. The year 2001 marked the consolidation of Sporting as professional Club, keen to guarantee its sporting and economic sustainability. In reinforcing this position, Sporting presented a new graphics based image, more stylised, rejuvenated and adequate for the profile of the modern day 3 million members and fans the Club now boasted. The modernisation of the now institutionalised image was preceded by the conducting of a diverse range of studies of marketing strategies that traced a path of evolutionary logic of the growth of the emblem of the Club from its original to its current form: highlighting the Club's traditional values of: Effort, Dedication, Devotion and Glory, and the symbol and colour associated with the Club: the rampant lion and the colour green. Various loose affiliations and denominations, in the form of the different names used to define the Club outside of Portugal (with the Club largely being known a "Sporting Lisbon" abroad), worked to create a little anarchy and diversity in the shaping of the new identity of the Club that has always aimed to be a leader of the national panoramic and to be of international reputation. The new graphical solution however, to the contrary, presents a unified and coherent stance. Without breaking away from the traditions of the Club the image presents itself as contemporary, instructional and popular, while simultaneously presenting itself as being fit for the international scene: the scene in which members and fans of Sporting alike expects the Club to always stand. 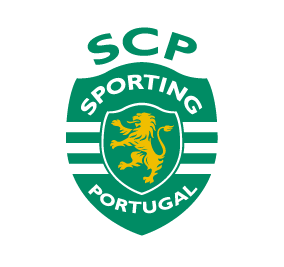 The framework of the new emblem was simplified, while still maintaining the colour green and the shield, with three horizontal stripes being introduced that symbolise the kit of the Club; The words "Sporting" and "Portugal", now written as complete words and no longer as abbreviations or initials, where introduced to emphasis the national dimension of the Club and to present the official name of the Club on the international level; The lion was stylised with a reinforcing impact that now presented it as a golden lion. 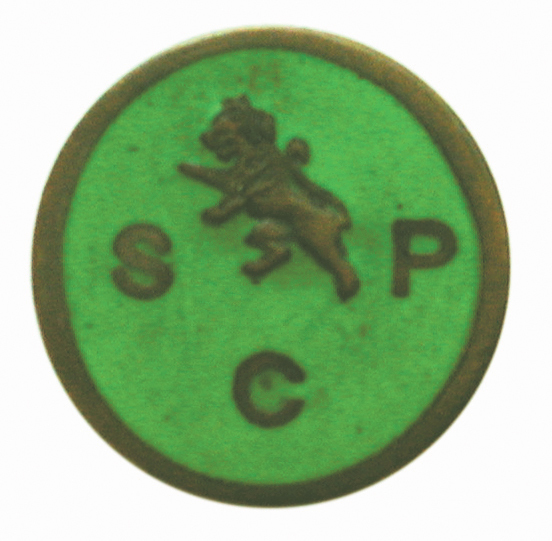 As the crown of the badge, the initials SCP continued to perpetuate the name that was now near a century old. 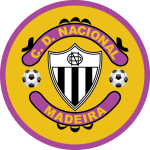 This symbol is to be applied to all institutions of the Club, demarcating a journey that, in addition to its visual effect, essentially represents the strategy and plan for the creation of a set of professionalised Portuguese companies that are more effective leaders in sports and the other areas in which they operate.